Q. I've heard people warn me about WI-FI security, are you using WI-FI and is your network safe? A. We do not use WI-FI to deliver service to customers home, and our network is protected by the same security that your cell phone call is protected by. 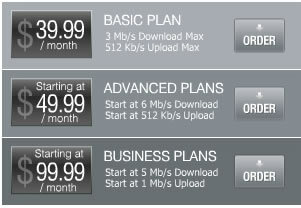 Q. I have had other internet services that get really slow durring busy times, will have the same problem with you? A. we cannot control any specific website performance, but we do monitor our network very closely to make sure we DO NOT slow down during the busy times, we will make sure your browsing experience is the very best it can possible be through our network! Q. There are a lot of trees around me and I cannot get other services because of that, will that stop me from getting your service also? A. Most likely we can still get you service, we will check for service at your home and tell you what service is available to you!